We are a leading Manufacturer of air pollution control plant from Bathinda, India. of unit is usually mild steel. Hoods: They are provided for point source collection of flue gases as and when they are generated at different processes. They are therefore scattered through out the unit wherever the covered processes are located. Headers and Ducting: They form a grid for collection & conveyance of gases collected at hoods to the treatment equipment. They run through the unit depending upon positioning of hoods. 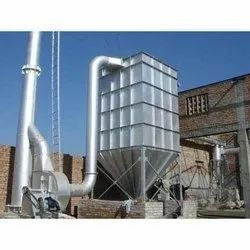 Fine Filtration Device: Pulse Jet based self cleaning Bag House fitted with fabric filters is provided in the system for separation of particulate matter borne in the air. Cleaned air passes through the top plenum of the Bag House where as dust collected settles at the bottom of the hopper. This is periodically cleaned. Induced Draft Fan: A high efficiency negative suction centrifugal fan is provided in the system. It generates the suction for capture of flue gases at point, their conveyance and finally their release through stack after filtration. Stack: A stack of adequate height is provided for release of treated air into atmosphere. Such height is stipulated by the law in force in any particular area (30m in India).